Occassionally I have the opportunity to put work on a nice daisho (matched set). I recently completed this daisho tsuka & saya project. On it I used 4 mm gold silk ito (cord) on the tsuka (handles), and gold/black urushi (lacquer) base topped by 4 orange tinted transparent layers of cashew (lacquer). Although I had to cut new saya for both the katana and the wakizashi, the tsuka, seppa, fuchi/kashira, menuki and tsuba are all original. The katana is a Koto Bizen blade in good polish with a nice sori and fumbari. 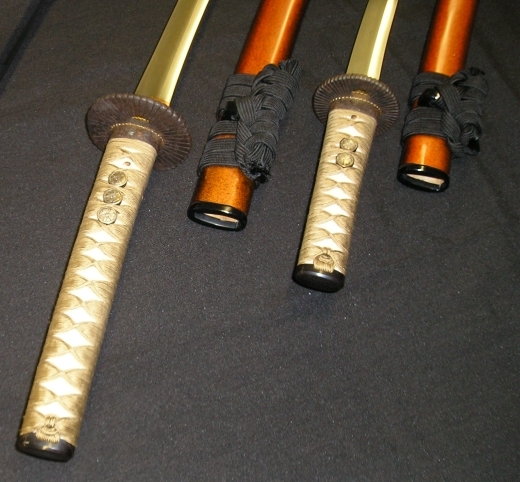 The wakizashi is a Shinto Seki blade in good polish with a classic sanbonsugi hamon. This is really beautiful, Mr.Buck. I hope I can do something like this some day. But I'm really interested in details of the tsukas' wraping. As you say you used 4mm ito. That means you used the style like in this photo: http://www.tsukamaki.net/blog_pics/tsuba_tsuka_resize01.jpg , but because of the size of the pictures it is barely seen. How did you make crossovers in the menuki area? It would be really good if you post larger photos of the tsukas. Thank you in anticipation.